Korea, often referred as “Rivers and Mountains embroidered on Silk” in ancient Chinese texts, is a land of rich culture, art and natural scenic beauty. One of the major important cities of the nation is Gyeongju. Gyeongju is a coastal city located in the southeastern corner of North Gyeongsang Province. Lying 370 km from the Korean Capital, Seoul, it is surrounded with numerous low mountains, which form the outliers of the Taebaek range. Gyeongju has the typical costal climate, wet and mild. Autumn typhoons are quite common. The rich cultural history of Gyeongju dates back to 57BCE, when it was recorded to be known as Saroguk. Later on with expansion, it was named as Silla. With a period of name changes and changes in rule, by 668 AD the city had established itself as the hub of Korean politics and culture. Gyeongju’s rich cultural aspects and monumental structures had faced tremendous assaults from numerous battles and attacks. In the beginning of the 20th century, various archaeological excavations revealed a lot about the region’s rich cultural aspect in earlier centuries. Gyeongju is a forerunner in bearing the name of ancient Korean Buddhist art. It is a land of numerous pagodas and sculptures. Various remains of temples and palaces also speak volumes of the unique artistic expression of the ancient era of Korean culture. This historical importance along with the beautiful landscape, makes Gyeongju a major tourist attraction. With 1000 years of Silla rule, you can find many archaeological sites here. 1. Gyeongju National Park: The Natiional Park is one of the most important place to witness Silla sites. One of the oldest astronomical observatories, the Cheomseongde observatory is situated inside the park. It also is the site of the Royal Tomb Complex. 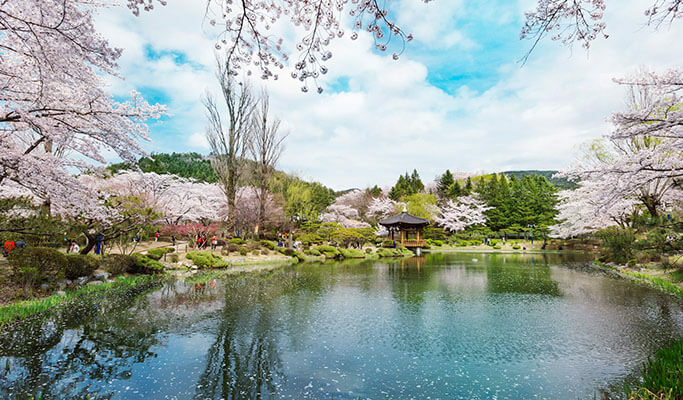 The beautiful Anapji Royal Pond Garden is also located inside the National Park, along with the Gyerim forest. 2. Bulguksa Temple: Constructed in 528 AD, this temple is a bright example of the ancient Korean stone relic and its artistry. The history of this temple is as fascinating as its beauty. 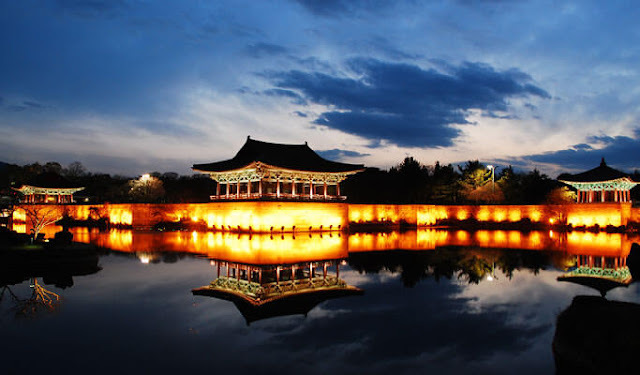 It underwent many renovations and improvements during the Goryeo Dynasty, but unfortunately was burned down during the Japanese invasion during the late 14th century. However, the early 17th century rulers, began reconstructing this amazing structure and by the mid-19th century, the Temple was formed. In later years, it became a target for vandals & robbers. Ultimately, the temple was formed under a committee in 1973 and is home to a number of cultural relics as Seokguram Grotto, Saritap Pagoda, Dabotap Pagoda and many more. The Bulguska Temple has been regarded as a World Heritage site by UNESCO. 3. Namsan: Another shining example of Korea’s cultural remains, as the Chibulam Relief that is carved into stone. There are about 80 such beautifully carved structures throughout the region. The Gyeongju cuisine has its typical Korean coastal flavours of spice and salt. Some of their dainty dishes include the Gyeongju Bread, which is a red bean pastry, the Ssambap, a rice dish served with other side dishes. This place is a major attraction for seafood lovers too. The nearest airport of Gyeongju is in Busan, which is an hour away by express bus. The most popular mode of transport from Seoul is the Express bus, which takes approximately 4 hours from the Airport and leaves at every 40 minutes. There are 4 direct trains from Seoul which takes approximately 2 hrs. 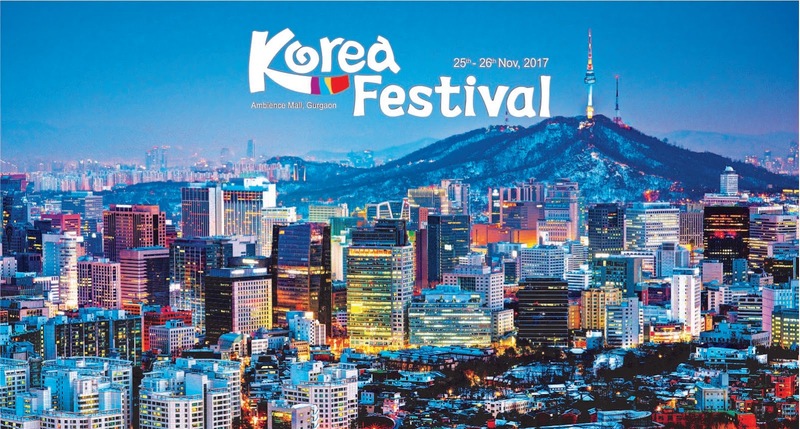 Glocal Encounters Tourism Company has partnered with Korea Peace Tours, an initiation of Korea Tourism Organization that will not only enable people to experience the beauty and history of the nation but also help form a better understanding of its rich cultural heritage with its interesting tourism itineraries. You can also take a shorter route and get a glimpse of this beautiful land at the Korea Tourism Organization Fest 2017 from 25th November 2017 to 26th November 2017 at Ambience Mall, Gurgaon. For more Check here.